A well-designed reception area is a focal point within your lobby. The reception desk and the impact wall behind the reception desk act together as an anchor point within your lobby design. This area should reflect the level of quality that you supply to your clients and it should be impressive enough to visually cue your visitors to approach and sign in. In the reception area, a company logo should be prominently displayed, either on the front of the reception desk itself, or on a wall behind or tangent to the reception desk. This is the first time a visitor sees your logo upon entering the building, so invest more in this piece by upgrading the finishes and the lighting. And, possibly most importantly, consider the personality and appearance of the person sitting behind your reception desk. The receptionist or security guard that staffs your lobby is, most often, the first person that a visitor to your facility meets. How they interact with your visitors affects how they feel about the entire experience of visiting and interacting with your organization. We discussed your reception area logo above. Now look around your lobby. Are the walls blank or are they covered in outdated product photography? Maybe you see a few faded and questionably modern art prints in gaudy picture frames, or maybe you see a handful of random papers taped to the wall that tell you about this Saturday’s soccer tournaments and a bake sale at the church. Do any of these haphazard props communicate clearly to your visitors that you are an innovative and future thinking organization? We’re not suggesting that you need to plaster your lobby with every product photo from the catalogue, but take this opportunity to make an impactful, lasting and favorable impression on your visitors. Maybe one of your company’s core values is precise teamwork. 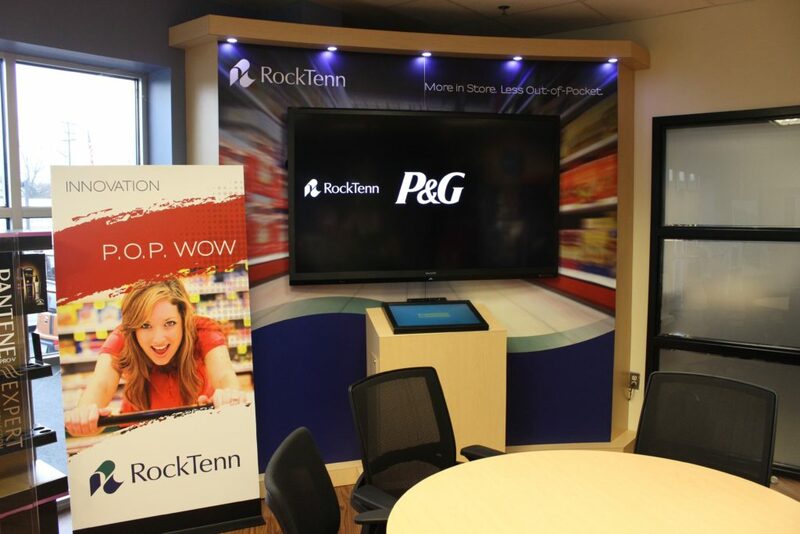 Using your primary brand color, showcase a high resolution colorized photo of your factory team members as a large photo mural in your lobby. Perhaps you make the highest quality residential furniture upholstery in your industry. Showcase some of your fabrics in a unique way as a graphic sculpture on the wall above the lobby seating area. Being creative with graphic elements in only a few high impact areas can have a much greater and more lasting effect on your visitors first impression of your organization. When was the last time someone left your building and told other people about the creative graphics or art piece they saw in your lobby? So your company is innovative and future thinking. Shouldn’t the furniture in your lobby design also reflect that innovative spirit. Often we see lobbies outfitted with grandma’s wingback chairs – Oak cabriole legs and 1980s floral prints in all their glory. Do you really think it is appropriate to showcase your company’s product innovation and fast growth awards in a Cherry corner curio cabinet? Consider that the appearance and condition of your furniture also contributes to the story of your organization as a whole. 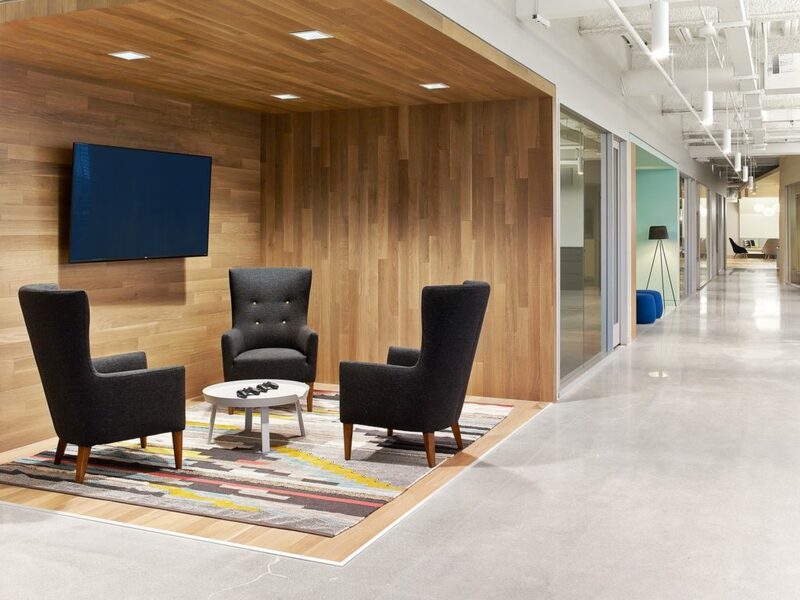 Selecting contemporary furnishings that are comfortable aligns with your company’s innovation story and tells your visitors that you are thinking about their experience within your facility. Look closely at your floor, walls, and ceiling. The finishes that you choose while renovating your lobby also contribute to the overall visitor experience in your lobby. Carpet patterns, stone, solids surfaces, wood tones, metallic and solid color laminates, paint colors – all of these architectural and millwork finishes should be considered and compared to your brand standards. Look closely at your ceiling tiles. Are their water leak stains? Does your exposed ceiling showcase sloppy data cabling? 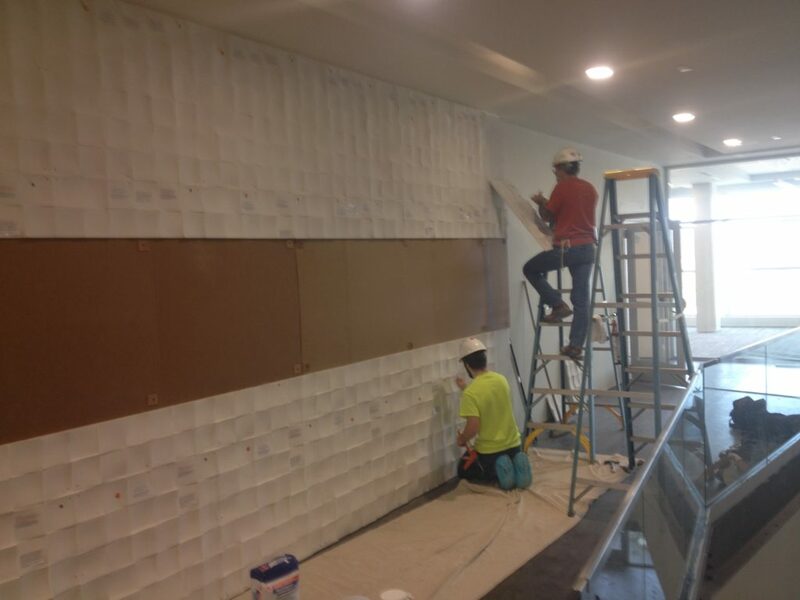 Lobby design requires picking finishes. Good lobby design weighs finish options against your organization’s brand guidelines and brand tone. As your organizational messaging changes over time, so should your lobby design change to reflect the reputation, achievement, and strategic direction of your company. Nothing is worse than entering a poorly lit lobby. Outdated fluorescent ceiling grid lights can produce a dim, yellow tone of light that makes a lobby feel like a cave and stuck in the past. Updating your ceiling lighting to LED fixtures that mimic natural light helps to provide a more welcoming and refreshing experience. 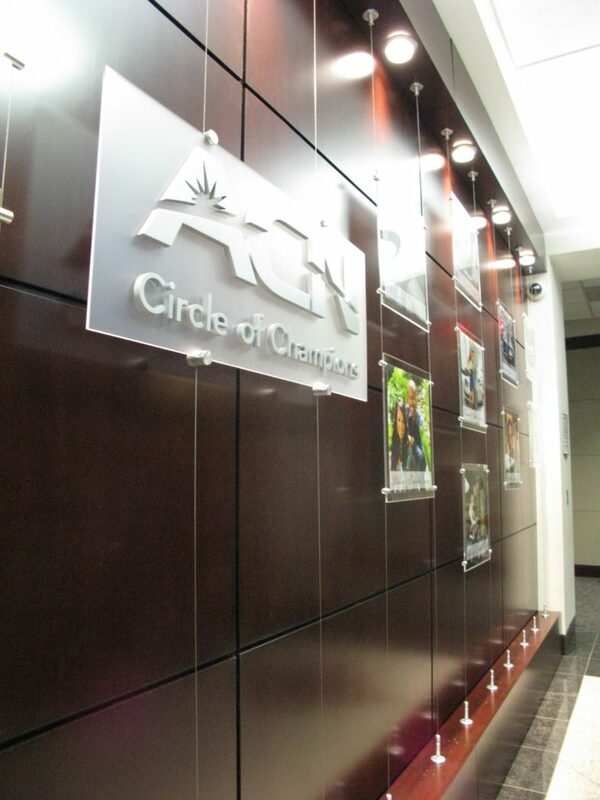 Accent lighting, such as wall-washing fixtures and low-voltage display lighting, adds focus to key areas that you want to be noticed by highlighting and adding visual complexity to your company logo, graphic impact walls and award displays. 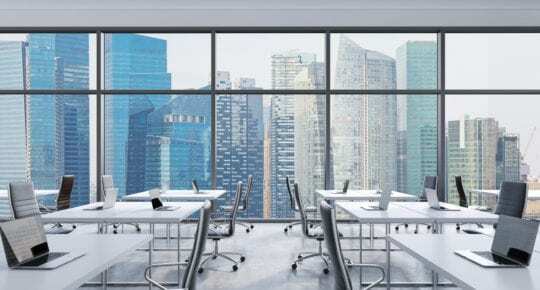 Natural light entering through your building’s windows and doors can greatly affect the airiness and openness of your lobby design promoting a feeling of well-being within the space. Conversely, too much sunlight can cause glare and make your lobby uncomfortable at certain times of the day. You may want to consider mitigating this by installing programmable mechanized blinds or perforated window graphics to help cut down on an overabundance of direct sunlight at peak times every day. Look for our next post discussing the key elements to consider while designing your innovation space. 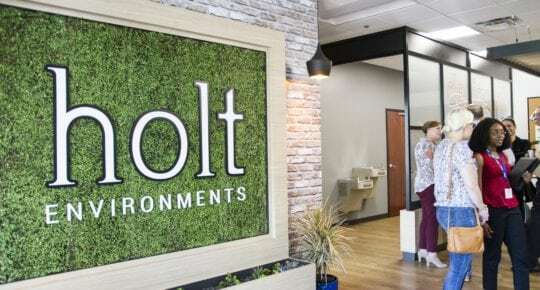 Holt Environments is an experiential agency focused on creating memorable spaces – their service offerings include lobby design, conference room design, showroom design, interactive touch screen and multi-touch wall design, facility workplace innovation, environmental graphic design, corporate museum design, and experiential marketing. 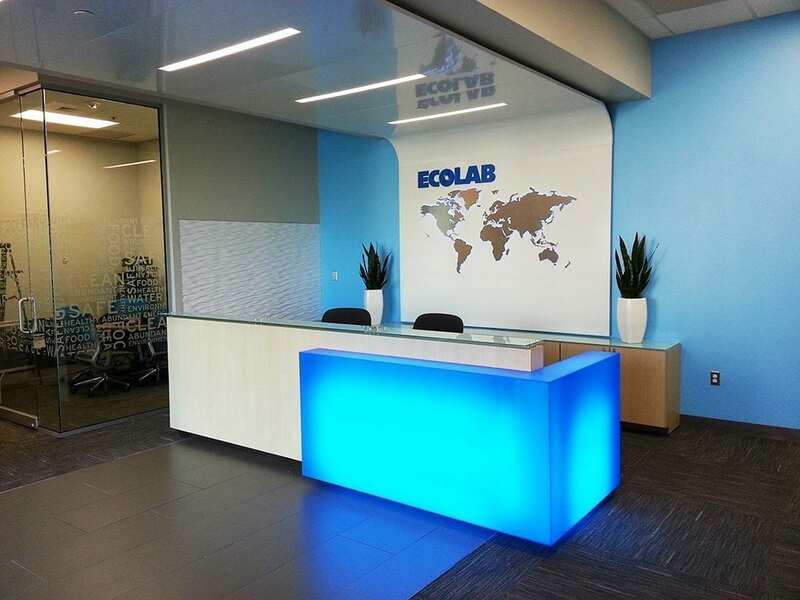 What connects their varied projects is a collaborative design process that produces a tailored experience for each space supported by turnkey fabrication and installation.